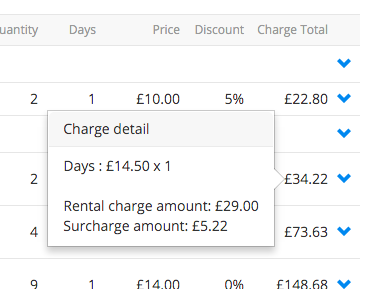 Surcharges are an optional but powerful feature of Current, that will allow you to automatically add additional charges to Products when added to an Opportunity. A cleaning charge that you add to your equipment, such as if it could get dirty and require cleaning when it is returned. It may be that the customer returns it to you clean, or they optionally pay for cleaning as an added extra. This could be a percentage of the rental charges, or a monetary value per item for example. An installation charge - you may charge to install your rental equipment and it might be you charge an additional amount for this. An insurance or damage waiver charge - you may agree that if your customer pays an additional 15% of the rental charges, then if the equipment gets damaged within reason, you will cover the cost of it. The following describes how to set up surcharges. Surcharge Groups are a requirement when creating Surcharges, so you'll need to create these first. The grouping for surcharges allow you to have multiple surcharges that belong to one group. An example of this might be that you have three types of cleaning charge. The surcharge group would be called Cleaning Charges and then you could have three cleaning surcharges, one for large items, one for medium items and one for small items. Creating a surcharge group is as simple as giving it a name. Here is a diagram showing how, when you have set up the Surcharge Group (where it says Cleaning Charge) you can select one of the surcharges, contained within that group, against the product. A product can have multiple surcharges, selecting one surcharge from each group. To set up Surcharges, go to System Setup > Surcharges. Click the green 'Add Surcharge' button. Give the surcharge a name (for example Cleaning Charge: Small Items) and choose the Surcharge Group you created earlier. When choosing the Rate Type field you can choose Amount (a monetary value) or a percentage. If your surcharges are subject to a different tax rate, you can change the tax class here for that surcharge. When you've set up surcharge groups and surcharges, to add them to a product simple amend the product and move to the surcharges section, then you can see the surcharge groups listed on the left, and the applicable surcharges can be chosen from the drop down boxes. You can see the surcharge value that will be applied to the product as well. You can choose one surcharge per surcharge group. When you have added your surcharges to products, you can now apply them to Opportunities. To do this, amend the opportunity and select the applicable surcharges.